The T-Flight is the most compact machine ever to come from the Alberti design team, the new T-Flight enables small to medium sized manufacturers to get in on the batch one concept. Although compact in size, the T-Flight is not limited to working with smaller panels. 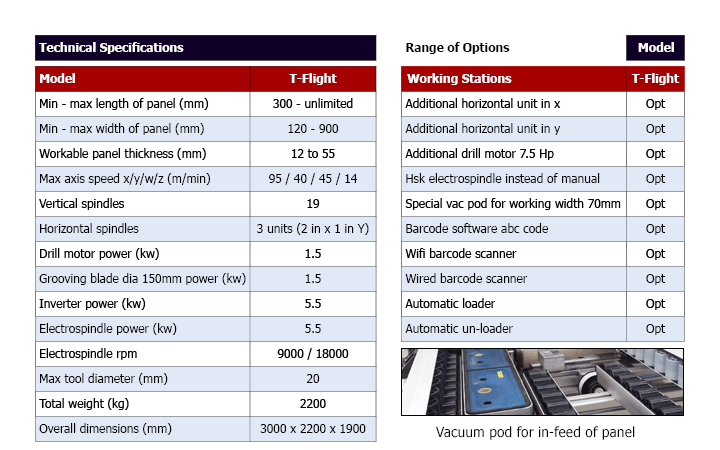 Boasting a machining facility for panels of 3000mm long, 900mm wide and 50mm deep, it provides a flexible solution for manufacturing single parts continuously, regardless of dimension. The machine can be run as a stand alone entity or easily within an automated line. A standard laser allows for exact measurement of the panel length which in turn will automatically compensate for dimensional errors in the panel. Whilst the machine is essentially a vertical and horizontal drill, aggregates such as grooving and routing can be added to enhance production. 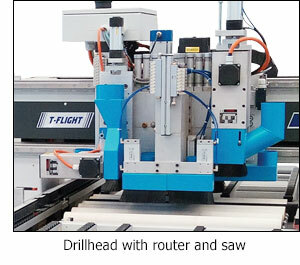 The T-Flight/CN is offered with the new CNC Tpa, Compact-Seven PC control, based on a Windows 7 operating system. Programming and management of the machine is via TPA-ED32 software. The programming system enables individual programs or work lists to be selected and, if required, the programs can be recalled by reading a label containing a bar code.